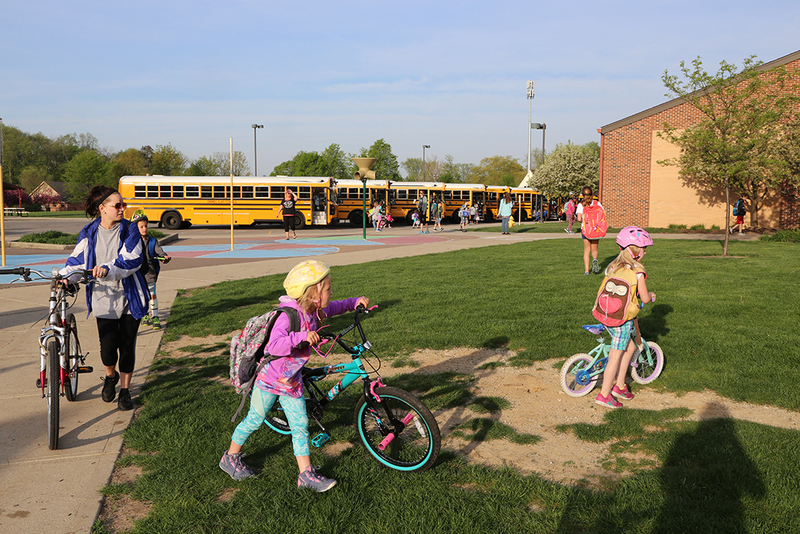 Carmel Clay Schools joined more than 2,500 schools nationwide May 9 for National Bike to School Day, with hundreds of students pedaling their way to class. 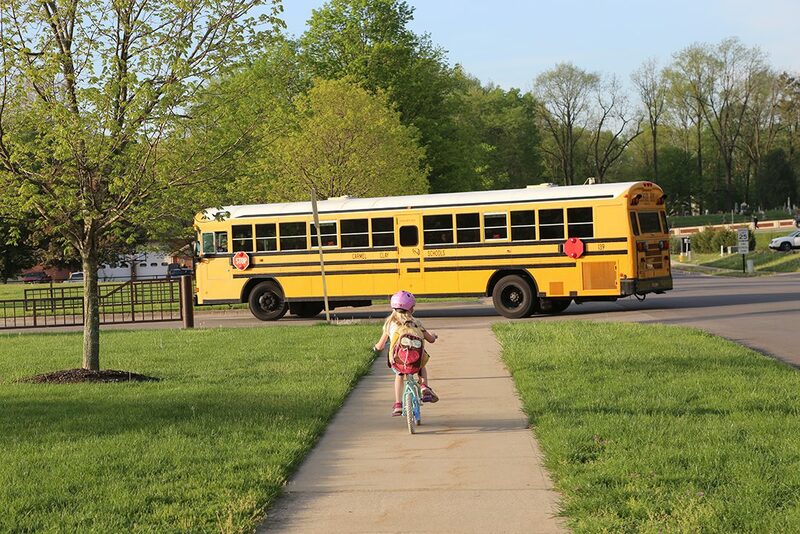 The district has taken steps to make it easier to bike or walk to school, adding bike racks at elementary campuses and extending sidewalks to connect with nearby neighborhoods. The City of Carmel also has worked to become more bike friendly near schools and elsewhere. Some parents make walking or biking to school a part of their daily routine, but others don’t see it as a realistic or safe option. Transportation research has shown that taking a bus is by far the safest way for kids to get to school. The National Highway Transportation Safety Administration’s Fatality Analysis Reporting System shows that students are 70 times more likely to get to school safely in a bus than other types of vehicles, and almost 20 times more likely to get to school safely in a bus than other modes of transportation. So, in a city that values bicycling as much as Carmel, what’s a parent to do? For some parents, regularly biking to school is an easy decision. Chad Braugher, who has a 6-year-old daughter at Carmel Elementary, said he regularly surprises her by bringing the bike with the tag-along when school lets out. But other parents are hesitant to have their children bike or walk to school. Melinda Miller said she’s concerned about letting her son bike to Carmel Middle School. Some on the Carmel City Council would like to see more parents consider biking as an option for their school children. Councilors Ron Carter and Bruce Kimball were strong supporters of a new bicycle administrator position at City Hall, a role that eventually morphed into a transportation development coordinator that was approved at an annual salary range of $57,552 to $69,063, depending on skills and experience. That person, among other duties, will help identify and promote safe routes to each school. “We’re not forcing anybody, but we’d like to see this option come back,” Kimball said. Carter said some Carmel schools do a better job of promoting biking than others. Besides identifying and promoting safe routes, he said there are other things schools can do, such as placing bike racks in convenient places. Carter said he remembers years ago that a walk program was going to be rolled out and that some parents spoke out against it. He said some of the reasons were concerns children could be abducted by criminals or attacked by coyotes, or that kids could fall into retention ponds. Carter said he doesn’t want to tell anyone how to raise their kids, but he said many children are responsible enough to handle biking to school on their own. He said grades four to eight are the primary target. Kimball said studies show that kids who bike to school get better grades, and if enough kids bike it could alleviate traffic congestion at car drop-off/pick-up lines in the spring. CCS spokeswoman Courtney Taylor said the district has 188 yellow school buses and the annual overall transportation costs for the district is roughly $8.5 million. Maintenance of student parking lots, such as potholes, is minimal. But for some parents the biggest hurdle is safety. Miller said even if a child is safe and responsible, motorists are unpredictable. Carter is a former crossing guard. He said a program like that in Carmel could help parents feel safe letting their children cross busier streets. Carmel Mayor Jim Brainard said there are safe paths to each school but he’s willing to invest in further path improvements. Some upgrades are already planned. “Most of the paths exist, but there are some improvements scheduled to be made in the next five to 10 years,” he said. Parents at Orchard Park and Carmel elementary schools have been organizing to oppose the idea that either or both schools could close as Carmel Clay Schools considers how to deal with aging campuses and declining enrollment projections. A major reasons they insist both schools should remain open is because they are perfectly situated for students to bike or walk to school. Chad Baugher likes to bike with his 6-year-old to Carmel Elementary and thinks the location is ideal. Emily Ehrgott, who has children at Orchard Park, said it’s important to keep schools that are walkable and bicycle friendly.